Brian Clement, Alternative Cancer Practitioner: You Are Not Welcome. Update 4: 16/6/15: The Carlton Airport Hotel have cancelled the event. Thank you Carlton! All advertised hotel venues have now withdrawn their bookings. Update 3: 16/6/15: The Connacht Hotel have rung to tell us the meeting has been cancelled. Thank you Connacht Hotel! Update 2: 15/6/15 The Galway meeting has now been moved to the Connacht Hotel. Update: 15/6/15 The Galway Clayton Hotel have let us know that they will no longer be hosting the meeting in Galway. Our friends at the Good Thinking Society have tipped us off about two events taking place in Dublin and Galway later this month. The speaker at both events is Brian Clement and his speciality is cancer patients. Alternative medicine practitioners of every hue are common in Ireland. However, this man has a particularly odious reputation. He runs a treatment centre in Florida called the Hippocrates Institute, and he and his institute are in big trouble. Florida’s Department of Health have their sights on him, as do the US Federal Trade Commission. Even former employees of his are up in arms about his practices. It’s been alleged that he is practicing medicine without a licence – a serious charge in any country. If this wasn’t bad enough, he’s been accused of giving false hope to seriously ill cancer patients. False hope is when you tell people you can help them or even cure them, when in reality you have neither the right knowledge nor the right skills to do make good on your promises. Tempting, isn’t it? You find people with very few options left, tell them an amazing story, administer unproven treatments to them and charge them a ton of money; all in the hope that luck will be on your side and you’ll get a great testimonial out of it. If things go badly, well, hey, you did your best. Win, win – at least for you; not so much your unfortunate patients. Most people would avoid this temptation because of basic morality, but as they say here locally, there’s always one. In public statements, Clement has said things like: “We have the longest history on the planet Earth, the highest success rate on the planet Earth, of people healing cancer” and “we’ve seen thousands and thousand of people reverse stage-four catastrophic cancer“. For anyone who has been affected by cancer, such extravagant claims would need a ton of independently verified evidence: evidence Clement does not have. The allegation by Canadian media is that he encouraged the parents of two young aboriginal girls to have them forego chemotherapy for leukaemia and to opt instead for alternative treatments such as wheatgrass enemas, detox diets and massages – none of which have ever been shown to have any curative effect on metastatic cancer. One of the girls involved, Makayla Sault, has already died. There is also an Irish connection. After a talk in Dublin, Stacey O’Halloran, a 23 year old Limerick woman with advanced metastatic breast cancer, gave up conventional treatments and traveled to the Hippocrates Institute. She died last year. Brian Clement has two speaking engagements coming up this June, one in Dublin and one in Galway. Based on the negative publicity from Canadian media, the lawsuits outstanding against him and his apparent lack of medical qualifications, we believe that this man is a danger to public health. We call on the Carlton Airport Hotel in Dublin, and the Connacht Hotel in Galway to withdraw their offer to host these events. Categories: Alt Med | Tags: alt med, cancer, dublin, galway, medicine, quackery | Permalink. 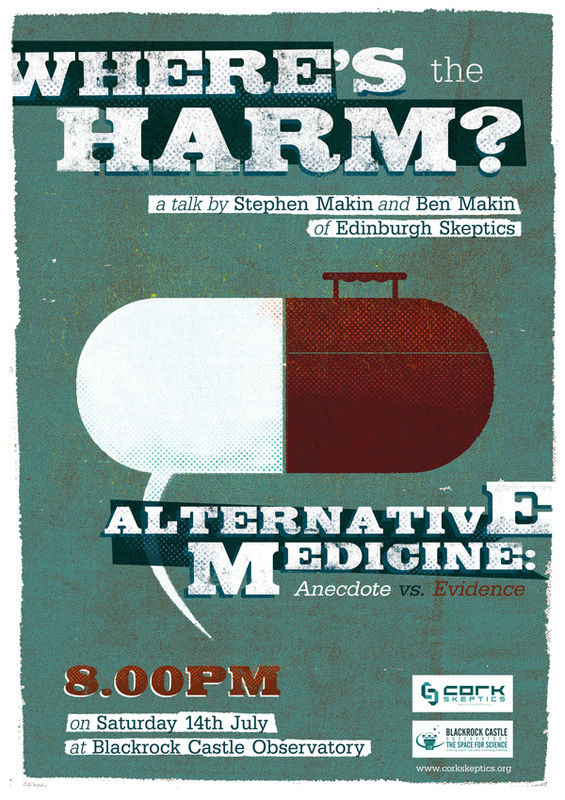 On Saturday 14th July, Dr. Stephen Makin and Ben Makin of the Edinburgh Skeptics will deliver what promises to be a fascinating talk on the anecdotes and evidence surrounding alternative medicine. 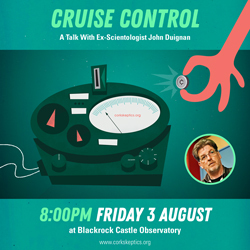 This talk will begin at 8.00pm at CIT Blackrock Castle Observatory. Dr Stephen Makin will reply, looking at the evidence and discussing cases where real harm has been done by alternative practices, and explaining why skeptics should continue to fight against quackery and cons. Ben Makin was raised on goats’ milk and home-made wholemeal bread and started her working life at Culpepper’s the Herbalist; she now maintains the Edinburgh Skeptics website. Stephen Makin was raised on soya milk and meditation, and ran away to Medical School to become a doctor. He is a Clinical Research Fellow in Stroke Medicine at Edinburgh University who spends too much time arguing with proponents of woo on the internet. This talk is open to the public, and is free to attend. Directions to Blackrock Castle Observatory can be found on our information page. We hope to see you there! Categories: Alt Med, Events, General, Pseudoscience, Science, Skepticism, Skeptics In The Castle, Woo | Tags: alt med, alternative medicine, anecdote, ben makin, Blackrock Castle, blackrock castle observatory, CAM, complimentary medicine, edinburgh skeptics, evidence, health, poster, science, skeptic, skeptics in the pub, stephen makin | Permalink. How effective are health food supplements? At her talk last week, Rebecca O’Neill mentioned a number of websites that might be of assistance if you are interested in the effectiveness of food supplements. The first website, an infographic from the Information Is Beautiful site, is particularly eye-catching. Above the “worth it” line is a relatively small list of the supplements that have been shown to be effective in particular defined cases. Below the line is a longer list of supplements where the jury is out on their effectiveness. Some of the same supplements appear in multiple places: so, while garlic can be helpful with blood pressure conditions, it has no proven link with the treatment of cancer. Clicking on any bubble brings you to a related study where you can get more information. It should be mentioned that this is a starting point only. It goes without saying that if you suspect you have a medical condition, it is worth seeking assistance from a qualified medical professional before embarking on a course of supplements. Donal O’Mahuna’s site, Bioethics Ireland, provides information on a large number of herbal remedies and alternative treatments. It’s a very useful source of information if you are looking for more facts on a particular supplement or remedy. Mention should also be given to Edzard Ernst’s and Simon Singh’s bestselling book “Trick or Treatment” (Eason / Amazon / Waterstones) where alternative remedies are put under the microscope. Finally, here is the audio of Rebecca’s talk to Cork Skeptics. It’s well worth a listen. Categories: Alt Med, General | Tags: alt med, alternative medicine, CAM, health, health food shop, health food supplements, herbal remedies, supplements | Permalink.